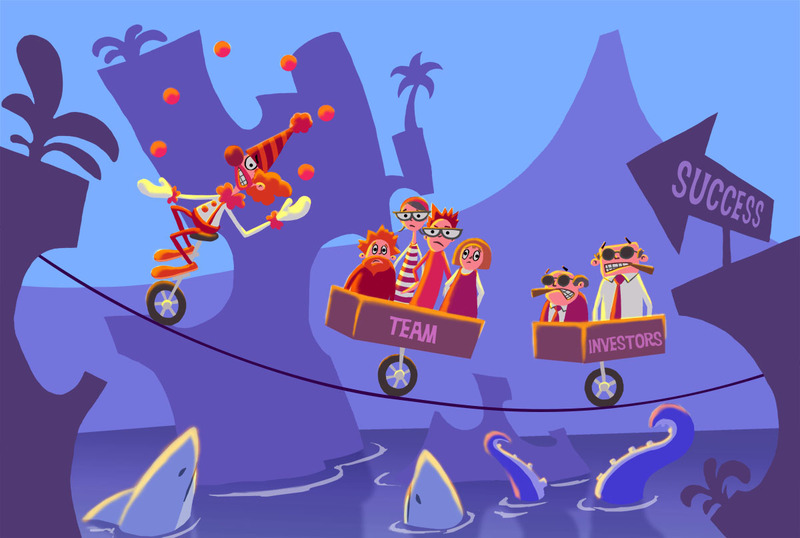 If you have led a team in the development of a new game, you probably felt at some point like the clown in the illustration above: trying to entertain people, while juggling 10 things at the same time, trying to navigate through a flimsy thin line without falling, and pulling your team along for the ride. The fact is that making games is risky business. There is no way around this, but prototyping the right things will help you reduce risk greatly. The main risk is of course figuring out what game you should build – what combination of game mechanics, compelling art, storytelling, and social will attract players and keep them engaged long-term. But this major risk is composed of many smaller risks: Do your game mechanics engage players? Does your game run smoothly in the delivering platform? Does your game stand out from the competition? Etc. Although there is no way to getting rid of all risk, you can reduce and keep your risks in check before too many of them pile up and bury your game down. This process of figuring out what product we should build is what is called product discovery. In the last few years, new methodologies have emerged that have changed the way we look at this process: lean start-up, design thinking, rapid prototyping, user-centered development- all involve prototyping and user-testing as essential tools to help us learn sooner rather than later what is the right product to build, connect with our users, and reach our goals. For a big picture view of product discovery I recommend this presentation by Teresa Torres, a coach and consultant who helps companies figure out how to build the right products. Is your game going to stand out in the crowd? Will players who see your game care about trying it out? Will your mechanics keep them engaged? Will they talk about your game with their friends and recommend it? It might sound strange to list concept art as a prototype, but the right concept art can be a very useful tool to test two of the foundations of a successful game: how to stand out and how to connect emotionally with your target players. In reality players do not connect to games and experiences exactly because of the art itself, but rather because of the attitudes and points of view that the art reflects and that resonate with them -what I have called Theme in previous articles. Art alone will not sustain players’ interest either; the “cool look” factor wears off quickly and needs to be accompanied by game mechanics and stories that continue reinforcing the Theme that got players’ attention in the first place. However, art is the easiest way to explore and start testing which Themes resonate with your target players and which ones don’t. Finding the right Theme and the right representation of it, will take you a long way towards standing out and connecting quickly with your players. Having a core loop that does not engage players is probably your highest risk and one of the most common causes of failure. All games have a core set of activities that the player repeats over and over to advance through the game. These repeatable activities are usually called loops and are the engine that keeps the player’s interest going. If this core loop does not help the players keep their interest and fulfill at least some of their initial expectations, they will quit and your game will be like a leaky bucket that needs to be refilled with new players constantly. Needless to say, it is much harder to reach any success with a leaky bucket. I have seen many developers trying to add more and more features to their games, hoping that these features will cover the hole in their leaky core-loop. The problem is that more features rarely solve the problem, and fixing the core-loop is much more complicated and expensive once it is interconnected to a bunch of secondary features. In the end, they would have been better off if they had taken care of their core loop before adding a bunch of extra features and smoking mirrors. Prototype your core-loop and make sure it works before trying to add more features! Once you have an engaging core loop, you need to make sure that players get to it. This means that the onboarding experience -the time since your players first start playing your game until the time they get to the core loop- needs to be as smooth and engaging as possible. Having an engaging core loop won’t help if players quit the game before getting to it. Prototype and test your onboarding experience. There is a sequence of social activities that happen around games that go viral or form a strong player community: players are compelled to share the game or the results of the game with their friends, which in turn are compelled to start playing the game and tell other friends about it. These activities are sometimes structured as part of the game mechanics inside the game, like in Clash Royale where the core mechanics of the game involve playing with other players, joining clans, etc. But social loops can also happen outside of the game itself. In games like Minecraft or Little Big Planet players create their own content and share it in forums and social networks, and although these activities happen outside of the game, they effectively promote the game to others. Social loops outside of the game are harder to measure, but even looking at number of social media posts and likes can veer you in the right direction. If you care about having a game that can grow its user base organically without a highly expensive marketing campaign, you need to prototype and test your social loops. Risk is part of the thrill of making new games and experiences, but building the right prototypes at the right time can help you keep your risks in check before they get out of hand and you fall into the sharks. The 4 prototypes above are important because they help you test and validate how your game will engage players, but they are not the only ones. In the end prototyping is about mitigating risks and the general rule is that you need to build the prototypes that tackle your higher risks first; this could be more related to the technology, or to your business model, depending on what you are innovating on. What prototypes do you consider the most important ones? Let me know in the comments. The Right Concept Art Will Save You Money. 4 Steps to Develop It. A good piece of concept art can be used as a prototype to test one of the essential elements that your game will need to succeed: connect emotionally to your player. Spending on concept art is sometimes viewed as a luxury or even a distraction, but if done correctly, concept art will save you money and put you in the right direction towards developing a successful experience. In this article I’ll dive into the significance of art, and four steps to develop effective concepts. We all have game ideas; some good, some bad. But having an idea is far from having a concept. A concept is something more concrete and more developed, and when it is done right, it is practically a prototype that will help you validate the foundation of your game or experience: the emotional connection with your players. One of the most important qualities of a successful game is the ability to connect emotionally with players. If you are able to connect with players and involve them emotionally through your game, you are practically on the other side. Don’t get me wrong, there are still many hurdles that can take your project off track, but you have achieved a fundamental requirement: the ability to connect and be relevant. In a previous article I talked about the 4-step sequence that successful games follow: stand out, connect, engage, and grow. In this article I am going to talk about how, by doing concept development the right way, you can figure out and validate early on if your game concept has the potential to stand out and connect with your target players. The art of a game is the window to all its other elements. 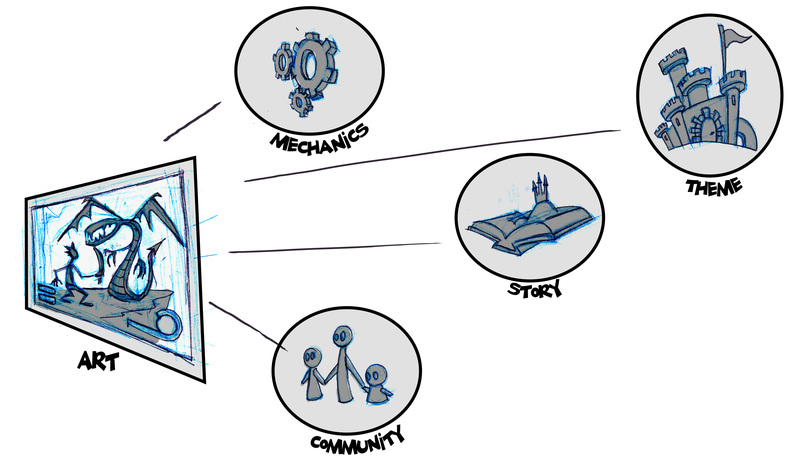 You access the mechanics, stories, and social features through characters, environments, and user interfaces. The right art style will help you engage your players and communicate the humor and fun of your game mechanics, or the drama of your story. The wrong one will be more of a hurdle than a helpful connector and amplifier. The right art style will also help you stand out and connect with players by communicating the mood, emotions, and theme of your game. The right concept art will reflect all the good qualities of your game: the emotions it creates, its core story, and its theme. Even if the core mechanics or story details are not represented in your concept art, the emotions resulting from them will. This is why the development of concept art can be a great tool to test if players connect with the basic theme and emotions of your game. Developing concept art can be a faster and cheaper way to test and validate one of the foundations of a successful game: emotional connection. The first step is defining who is your target player, what are your goals, and what is your point of view or the reason you care about making this game. The second step is to define a Theme that your players resonate with. The only way to know if your Theme resonates with an audience is by testing: pick a few members of your audience and talk to them about your Theme, see if they relate with it. Remember that Theme is not a topic, but an opinion about a topic. People don’t resonate with a topic by itself like “zombies in a post-apocalyptic world,” they resonate with views about the world that those topics make easy to represent and that they agree with. In the case of zombies in a post-apocalyptic world, a possible Theme would be: “only the cut-throat can survive in the world.” For more information about what a Theme is and its role as an ingredient to build an engaging game you can look at this article. Once you defined your theme, pick an Art Style that also resonates with your audience and brainstorm some ideas about possible mechanics, stories, and social interactions. I am not arguing for being a copycat regarding the art style. It is about narrowing down possibilities and starting from solid concrete examples pointing in the right direction. Once you have those, you can innovate within clear parameters. As with Theme, the only way to know if your Art Style will resonate with your audience is by showing them pictures of similar art styles. 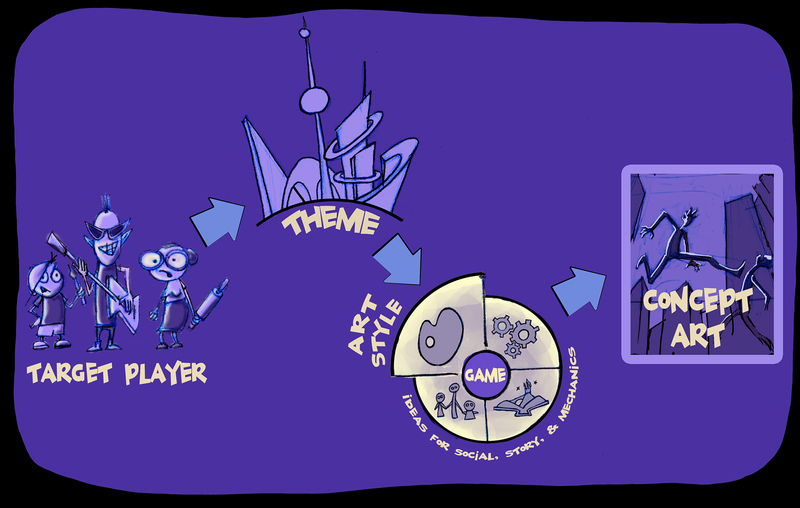 Finally, with a clear Theme, a ballpark idea about the art style, and ideas about story, mechanics, and social interactions; create a piece of Concept Art. This piece should represent your main activity or conflict, and your Theme. Once you have something concrete, get feedback from your audience and iterate from what you learn. 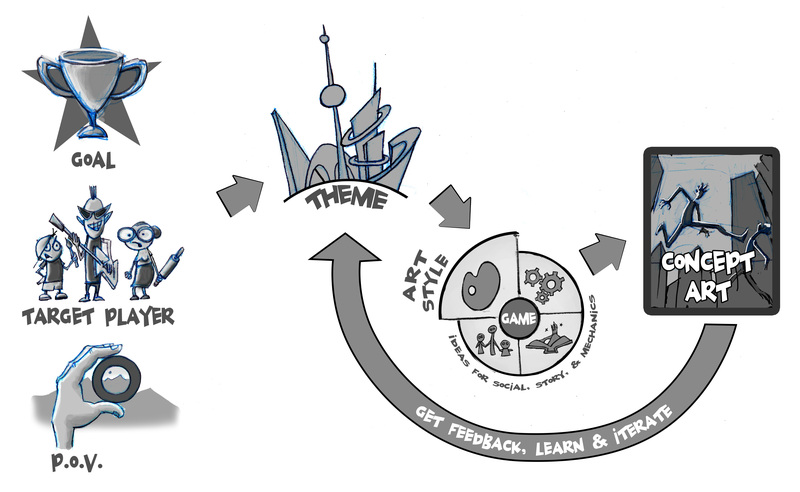 If you follow these simple 4 steps, you will end up with a concrete piece of Concept Art that connects with your audience and can help you as a guide or compass throughout development. You will not have a game yet, but you will have a good foundation to build one and something concrete that can guide your decisions for the rest of the development process.